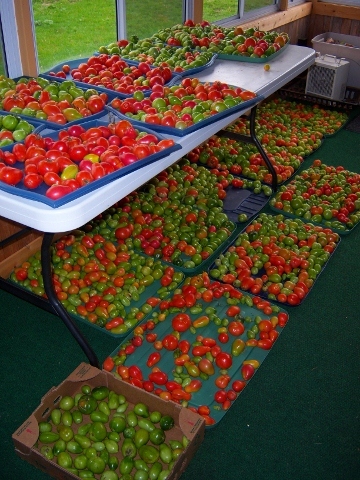 This is what’s left of our tomatoes after two days of salsa-making and a lot of eating: piles of tomatoes ripening on trays and on the lids of our plastic storage boxes. Today I plan to can all the red ones. Usually we freeze more than we can, but this year we’re making space in the freezer for the next chicken butchering, and that means canning rather than freezing. I got a lot of shallow cardboard boxes at the grocery store to ripen the rest of the tomatoes one layer at a time. 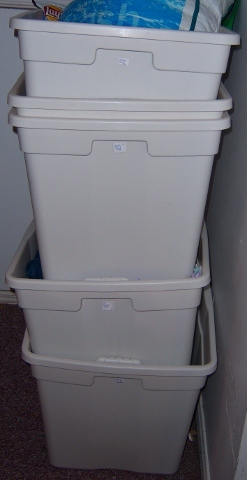 Today’s project, besides canning, is to put all the green tomatoes into these boxes. Soon we expect serious frosts so that we’ll need to take the tomatoes from the verandah into the house each night and once they are in boxes, that is an easy job. After putting the tomatoes into the cardboard boxes, we’ll clean the plastic lids they are currently on and put all of them back on our storage boxes in the basement. That should straighten out all our messy piles and the whole basement will feel so much neater! Hopefully, at the end of the day we’ll have many jars of tomato sauce, neat boxes of green tomatoes, and a neat basement. 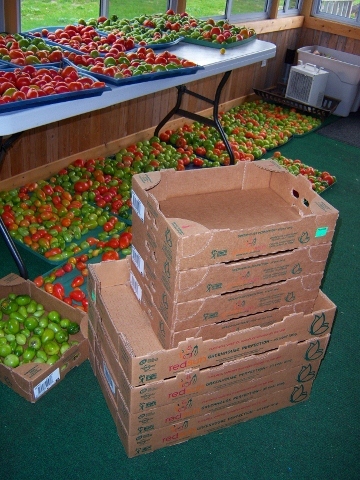 Wow-that is a lot of tomatoes. It is a good feeling to have food put away for the winter.